More than your average service! Basic checks and oil & filter changes certainly prolong the life of your vehicle and save money on unforseen repairs, but a Super Service takes your vehicle’s performance to the next level. 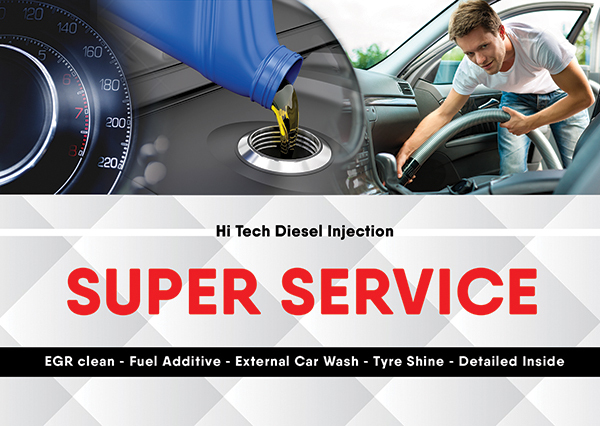 A Hi Tech Super Service will help fuel cycle through the system more efficiently and remove/prevent the buildup of deposits on your engine & lubricate engine seals. To ensure your vehicle performs and looks its best – a Super Service is the way to go. *Super Service is additional to a general or logbook service.